We were sent a couple of kits to try out, and the boys were really keen to give it a go! The example on the box looks absolutely amazing! I have to say ours did not look anywhere near as good as that, but the boys did enjoy the activity a lot. The difficulty with making it look as good is that (like most people I would think?) the boxes we have around in the home don’t tend to be totally plain, but printed as they are from things like Amazon deliveries and big boxes of nappies. Also ours could have done with being a little taller. The point of Makedo is to find what you have, and make do with what is around you just like with normal junk modelling, so there will be variation in everyone’s finished design depending on what kind of boxes and supplies you could get your hands on. My kids were not really bothered that our bus did not look like the one on the box, as they were still proud of what they had made but I can imagine some more perfectionist children may have an issue with this? Perhaps a solution would be to paint the cardboard to cover any unwanted markings and then you could make a really effective design. Re-usable clips. These are made up of two parts – the pins are pushed through a hole and then secured with the clip. These can then attach any two pieces of cardboard together. The Find and Make transport kits also come with a set of stickers to decorate your boxes. In this case we had stickers for the outside of the bus with number 15 to Trafalgar Square, and all the bus lights, then lots of little details for the inside of the bus too. Because the product is so open ended, no instructions are given but there is a sheet of inspiration with lots of different ideas and designs. Once you have finished with your model, you can reuse all the clips and tools to make something else. 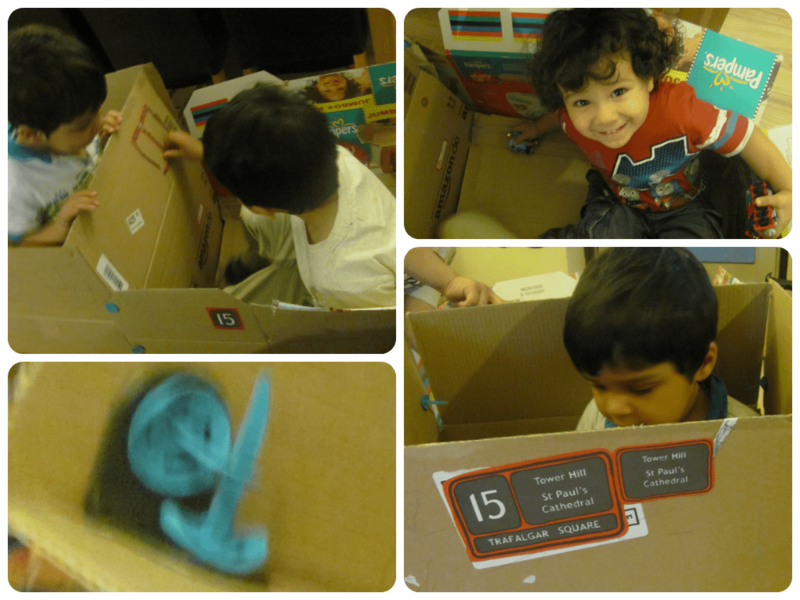 We attached several boxes together to make our bus big enough. Mr Z (5) was able to punch holes and put the clips on with help and supervision from me but would not have been able to make a full model independently yet. Mr T (3) was really enthusiastic about taking part and making the bus but was too small to use the tools. His main role was sitting in the place of the bus driver with his steering wheel made from a paper plate and he was in charge of sticking on a lot of the stickers too. He was really happy with just doing that, so I did think it’s good that they can each enjoy the activity at their own level. The Makedo kits are very versatile. If you had a child of 6 or 7+ I think they could really methodically approach the task and make something really impressive. For us with 3 children age 5 and under including a couple of active toddlers it was more a case of everyone jumping in and quickly making whatever we could. The youngest two got more out of the role play of sitting in the “bus” once it had been made, and Mr Z got more out of the actual building. Makedo is pretty different than anything we have come across before and will be a great tool to have in the house for any families who enjoy junk modelling. I’m sure ours will be used for many different kinds of models over the years whether on this large scale or for smaller models too. It’s not just cardboard they can join together, but foam or any kind of junk modelling material so the only limit is your imagination really. The recommended minimum age is 6+ and I would say it is about right, although 5 and a half should be okay. 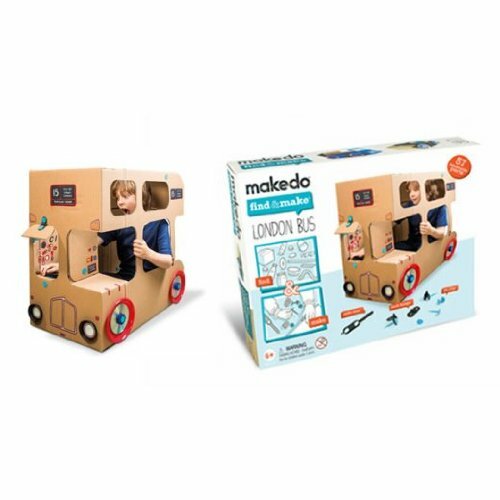 Little ones may love the idea of playing in a cardboard bus or tube, they are not really big enough to use the tools properly. If you have a look on the Makedo Website, you can see loads of really cool examples to give you some more inspiration! had seen them before! would love to make one soon! Sounds like a great tool for coming up with some creative things made from items around the house! That bus looks fab! What a great idea. We love junk modelling but don’t always have the inspiration! Will definitely be on the lookout for these! I’ve seen the name before but didn’t realise what the kit contained. What a great idea for imaginary play and anything thaty helps me to come up with ideas is a winner too! Those do look great! Not seen them before. My two are still a bit too young for them, but I’ll bear them in mind for them. They look great! My three would love them!